“ALL HANDS DOWN” The True Story of the Soviet Attack on the USS Scorpion. By Kenneth Sewell and Jerome Preisler. Forty-two years ago, in May 1968, the nuclear submarine USS Scorpion (SSN-589) sank in mysterious circumstances with a loss of ninety-nine lives. The American tragedy occurred during the height of the Cold War between the United States and the Soviet Union, and it followed by only weeks the sinking of a Soviet sub near Hawaii. Now in “All Hands Down,” drawing on hundreds of hours of interviews, many with exclusive sources in the naval and intelligence communities, as well as recently declassified United States and Soviet intelligence files, Kenneth Swell and Jerome Preisler explain what really happened to the Scorpion. In January 1968, a U.S. intelligence ship, USS Pueblo, was seized by North Korea. Among other items, the North Koreans confiscated a valuable cryptographic unit that was capable of deciphering the Navy’s top-secret codes. Unknown to the United States Navy, a traitor named John Walker had begun supplying the Navy’s codes to the KGB. Once the KGB acquired the crypto unit from the North Koreans, the Russians were able to ready highly classified naval communications. In March, a Soviet sub, K-129, mysteriously sank near Hawaii, hundreds of miles from its normal station in the Pacific. Soviet naval leaders mistakenly believed that a U.S. submarine was to blame for the loss, and they planned revenge. A trap was set: several Soviet vessels were gathers in the Atlantic, acting suspiciously. It would be only a matter of time before a U.S. sub was sent to investigate. That submarine was the Scorpion. Using the top-secret codes and the deciphering machine, the Soviets could intercept and decode all communications between the Navy and Scorpion, the final element in carrying out the planned attack. 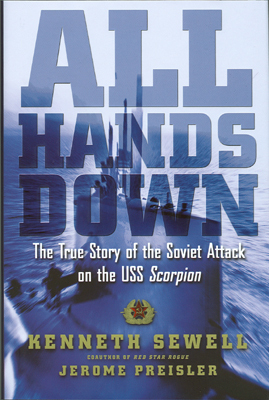 “All Hands Down” shows how the Soviet plan was executed and explains why the truth of the attack has been officially denied for forty years. Sewell and Preisler debunk various official explanations for the tragedy and bring the life the personal stories of some of the men who were lost when Scorpion went to the bottom. This true story, finally told after exhaustive research, is more exciting than any novel. “Having read all the books in Jerome Preisler’s Tom Clancy’s Power Plays series, I knew he could tell a fast-paced story based on real-world politics and interesting characters, and was intrigued when I found out he’d collaborated with a submariner named Ken Sewell on a nonfiction work about the USS Scorpion, as I also enjoy books on maritime history. I wasn’t disappointed. “All Hands Down” reads like a novel. I was surprised to learn early in the book that Robert Ballard, the undersea scientist who found Titanic, was actually on a secret mission to examine the Scorpion wreck when he did so. Incredibly (to me) the entire Titanic expedition was an excuse, or “cover story”, as Ballard was working for the CIA. The mystery of what happened to this submarine is tied together with heartbreaking stories of the crewmen and their families, and also the story of John Walker Jr., the spy who almost lost the Cold War for the United States. It is told in short scenes that leave you on the edge of your seat. Kenneth R. Sewell is a nuclear engineer and a U.S. Navy veteran who spent five years aboard the USS Parche (SSN-683), a fast-attack submarine. During the cold-war era Parche conducted a number of special operations, some of which were revealed in the book “Blind Man’s Bluff.” Since leaving the Navy, Sewell has held both Department of Defense and Department of Energy security clearances. In researching his book “Red Star Rogue,” Sewell had access to recently declassified intelligence files in the U.S. and Soviet military archives. Sewell also co-wrote “Red Star Rogue” The Untold Story of a Soviet Submarine’s Nuclear Strike Attempt on the U.S..
Jerome Preisler is the author of more than twenty-five books, including the best-selling “Tom Clancy’s Power Plays” series. A native New Yorker, Jerome is also a baseball commentator whose work appears on the New York Yankees’ YES Network Online.